reg = lqg(sys,QXU,QWV) computes an optimal linear-quadratic-Gaussian (LQG) regulator reg given a state-space model sys of the plant and weighting matrices QXU and QWV. The dynamic regulator reg uses the measurements y to generate a control signal u that regulates y around the zero value. Use positive feedback to connect this regulator to the plant output y.
reg = lqg(sys,QXU,QWV,QI) uses the setpoint command r and measurements y to generate the control signal u. reg has integral action to ensure that y tracks the command r.
where xi is the integral of the tracking error r - y. For MIMO systems, r, y, and xi must have the same length. reg = lqg(sys,QXU,QWV,QI,'1dof') computes a one-degree-of-freedom servo controller that takes e = r - y rather than [r ; y] as input. reg = lqg(sys,QXU,QWV,QI,'2dof') is equivalent to LQG(sys,QXU,QWV,QI) and produces the two-degree-of-freedom servo-controller shown previously. reg = lqg(___,'current') uses the "current" Kalman estimator, which uses x[n|n] as the state estimate when computing an LQG regulator for a discrete-time system. [reg,info] = lqg(___) returns the controller and estimator gain matrices in the structure info for any of the previous syntaxes. You can use the controller and estimator gains to, for example, implement the controller in observer form. For more information, see Algorithms. This example shows how to design an linear-quadratic-Gaussian (LQG) regulator, a one-degree-of-freedom LQG servo controller, and a two-degree-of-freedom LQG servo controller for the following system. The plant has three states (x), two control inputs (u), three random inputs (w), one output (y), measurement noise for the output (v), and the following state and measurement equations. lqg can be used for both continuous- and discrete-time plants. In discrete time, lqg uses x[n|n-1] as its state estimate by default. To use x[n|n] as the state estimate and compute the optimal LQG controller, use the 'current' input argument. For details on the state estimators, see kalman. To compute the LQG regulator, lqg uses the commands lqr and kalman. To compute the servo-controller, lqg uses the commands lqi and kalman. When you want more flexibility for designing regulators, you can use the lqr, kalman, and lqgreg commands. When you want more flexibility for designing servo controllers, you can use the lqi, kalman, and lqgtrack commands. 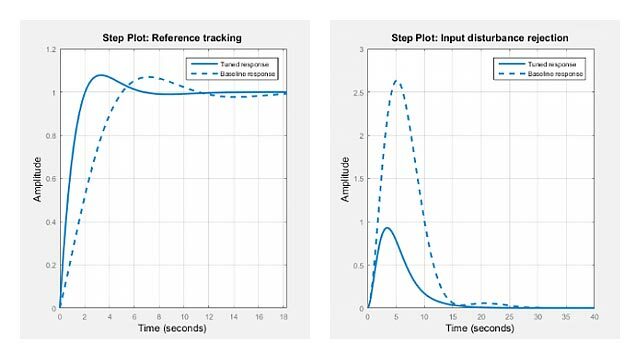 For more information on using these commands and how to decide when to use them, see Linear-Quadratic-Gaussian (LQG) Design for Regulation and Linear-Quadratic-Gaussian (LQG) Design of Servo Controller with Integral Action. A, B, C, and D are the state-space matrices of the LQG regulator, reg. xi is the integral of the tracking error r - y.
Kx, Kw, Ki, L, Mx, and Mw are the controller and estimator gain matrices returned in info.